I know this is a case of chasing easy marks, but still, I laughed. The teenagers, Kevin Nguyen, 16, and TJ Khayatan, 17, both of San Jose, had been left scratching their heads at the simplicity of some of the museum’s exhibits, including two stuffed animals on a blanket. “Is this really what you call art?” Kevin said in an interview over the weekend. Inspired during their visit on May 21, they experimented with putting a jacket on the floor and then a baseball cap, but neither drew attention. Like any driven artist, the two persisted, until, the breakthrough! Kevin then placed his Burberry glasses on the floor beneath a placard describing the theme of the gallery. He said neither he nor TJ did anything to influence museum visitors, such as standing around and looking at the glasses. Within about three minutes, people appeared to be viewing their handiwork as bona fide art, though Kevin said that without his glasses, he could not see what was happening too well. Anyway — good times! And nothing to do with the ferret headed weasel (a sphinx for our times! ), the senator from the north country, nor the lady whose nomination must not be acknowledged. So I guess this makes it just fun. Happy Tuesday, all. *Well. Actually…they are, in exactly the sense that Magritte argued that his pipe was not. 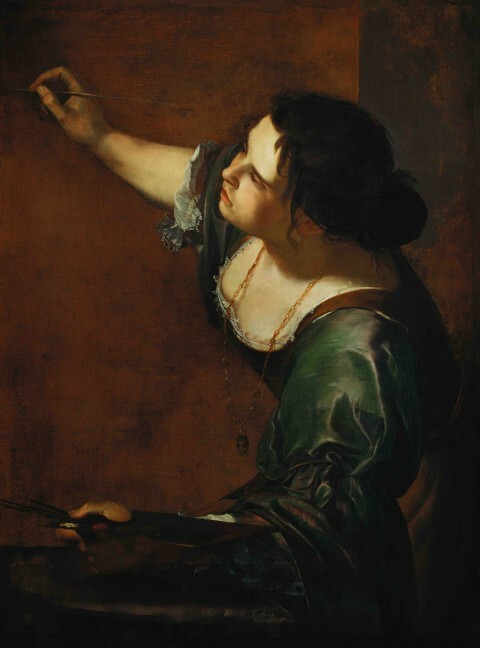 Image: Artemisia Gentileschi, Self-Portrait as the Allegory of Painting, between 1638 and 1639. This entry was posted on May 31, 2016 at 12:39 pm and is filed under Art, brain candy, random humor. You can subscribe via RSS 2.0 feed to this post's comments. 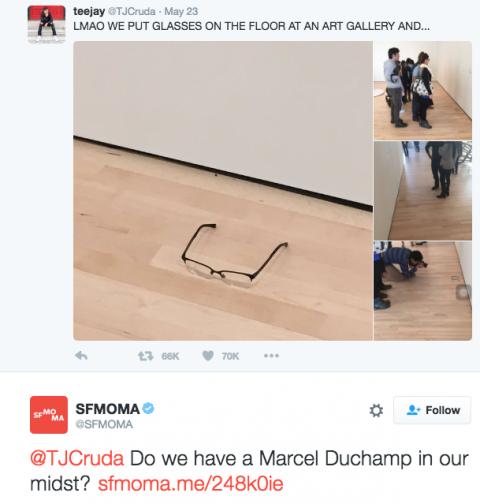 They learned a valuable lesson about art and how value is assessed in a society. Veblen would have been proud.